This week’s National People's Congress will complete China’s once-in-a decade leadership change, with Xi Jinping becoming the country’s new head of state. China's partners, and above all Americans, want a China that is a predictable and reliable. After all, huge business interests require stable relations with China. And there is no doubt, China is becoming more powerful – it is not only present in most parts of the world, but has also become a determining factor in the international arena. We would all therefore love to see Mr Xi as a Chinese Gorbachev. But getting to know Xi’s real personality, and his likely style of governing, feels like Kremlinology. And what is emerging is worrying. Xi is reputedly a charmer with an engaging and easygoing style. His wife is a famous singer, his daughter is quietly studying at Harvard. It is reported that he is even reluctant to embrace a luxurious lifestyle (although this does not appear to prevent some of his relatives from doing so). In public, Xi refrains from making controversial statements – an exception of course being the 2009 remark about the "full stomach" and the "constant finger pointing of Westerners" during a trip to Mexico. But make no mistake; Xi is not a reformer. His first months in de facto power do not point towards a new liberal era in China. Although he has announced an anti-corruption campaign, it bypasses judicial state institutions and is led by the Communist Party. This will turn anti-corruption trials into a tool of the leadership to silence any critical voices within the Party. His team has also side-stepped high-level officials who had advocated convertibility of the Chinese currency. And his first trips abroad will reportedly see him visit Russia and South Africa – Xi's way of saying that he thinks the United States and Europe are dispensable. He is not, it seems, interested in a G2 world. More significantly, the dispute with Japan over uninhabited islands is escalating. A series of incidents and an unprecedented number of territorial and airspace violations make the Senkaku Islands dispute one of the most dangerous conflicts in Asia (even though the islands have been under Japanese control for almost 125 years). It is notable then that China's military budget is, again, expected to rise at a 10 percent rate in 2013, even as China's growth rate drops to around 7.5 percent GDP. More from GPS: Can China, Japan avoid clash? Interestingly, Xi has expressed regret about the fall of the Soviet Union in 1989-1991, and how "no man stood up" to prevent it. Xi thinks there are lessons to be learnt. It is telling that he frequently refers to former Chairman Mao, making the point that the first thirty years of the People's Republic of China have as much value as those from the era of reform and opening up that followed. By framing China's history in such a way he conveniently fails to mention the crimes or mistakes of the Mao era. To be sure, there are a few signs that suggest a more positive outlook. Xi seems to have developed strategy to improve his public image by using popular quotes of ancient Chinese wisdom, rather than only quoting Mao. And there have been some hints that he would like to reform China's "re-education through labor" system. But let's wait and see if he is really serious about it. And though the situation in the South China Sea has calmed down recently, it is unclear if this is a diplomatic sign of the beginning of a more moderate stance, or just a strategic decision to focus on the conflict with Japan in the East China Sea and test the resilience of the U.S.-Japan alliance. It's possible that Xi got to the top of the Chinese state by making as few enemies as possible on his way up. He is very popular among the older generation of leaders in China and is a well-respected politician. His family has a tradition of being represented at the very top levels of power. China is the state of the Communist Party – and Xi is almost the embodiment of the Communist party. But this success brings problems of its own. He may, for example, have become prisoner of the party system: How do you make a convincing case against the Party elders and the Party-state interest groups when they made you what and who you are? Xi's first decisions and speeches seem to be designed to reassure exactly these influential groups – which of course includes the army. But a rather worrying observation is Xi's tendency to emphasize his authority by not referring to the "collective leadership" at all. China is a Communist Party state and is by no means democratic; it does not even aim to become a fully rule based society with a constitution that would stand over the Party. However, the principle of "collective rule" at the top is important as it basically creates a leadership with limited political risk attached, in effect preventing another Mao-style autocracy. By not evoking this collective principle on a regular basis, Mr Xi is changing the rules of the game. His predecessor Hu Jintao navigated between the various groups to keep his authority, but that made him a very hesitant and sometimes undecipherable president. Xi is different: He evokes the unity of the Party and its “glorious” past by downgrading the more recent reform agenda. At the moment, Xi's is only interested in strengthening and consolidating his own authority – a necessary strategy to create a sense of legitimacy at the top of the Chinese bureaucracy. Yet it does not convince the people, it does not create a supporting alliance for reform and it does not symbolize any progress for the rule of law in China. Xi is more hardline than most observers think. Let's hope he does not use China's foreign policy as a tool to demonstrate his hardline qualities. Next entry »On GPS Sunday: Debating Keystone, and what comes after Chavez? China should not be our priority. European Union, Western Union, NATO and United States in America should focus on strenghtening its priority positions. Due to unsuccessful US politics, our most valuable ally partner Great Britain lost Hong-Kong to non-Western Chinese. We not want one USA that plays-off its allies partners. Western Union needs to keep together and believe in NATO partnerships. Unemployment is 7.7% whoohoo! Happy Friday! I firmly believe China is stronger and storonger. And i think american people should not bored with china and the threaten of chinese . and ho says he is hardline your opinion counts as your opinion just because usa means something dosent mean anything at all malaysia gots its own opinion nigeria could its own opinion morocco got its own opinion colombia got its own opinion turkmenistan got its own opinion but other people arent as stupid as you writing something and called it the entire world. I should have known that my comments would disappear , after writing that we are a failed democracy and that the Chinese will eventully buy us out. Let your propaganda and foolish commennts brainwash your readers. People are catching up to your censorship. Maybe this new president is why Chinas stance has turned against its ally in N Korea..China understands there's more to its future than backing communist dictators and China doesn't what to be put in that category as well thinking outside the box..China also doesn't want to back a future threat from a future nuclear power as N Koreas puts it and missiles pointed at S Korea can be turned and aimed at China as well..N Korea with its young dictator has to learn not to bite the hand that feeds it ,that's all! !Diplomacy saves lives,wars don't just ask US!! The author is "worried" because Xi is no Gorbachev! Dream on...there will be no Gorbachev in China despite the CIA and all western spy agencies burning billions of cash and tons of midnight oil on that objective. Not to mention taking control of CNN, BBC, FOX and other western media outlets. Did nobody notice that on issues of foreign policy the western media seem to have a single perspective on all foreign policy issues. The confusion comes from the way Chinese is romanised. 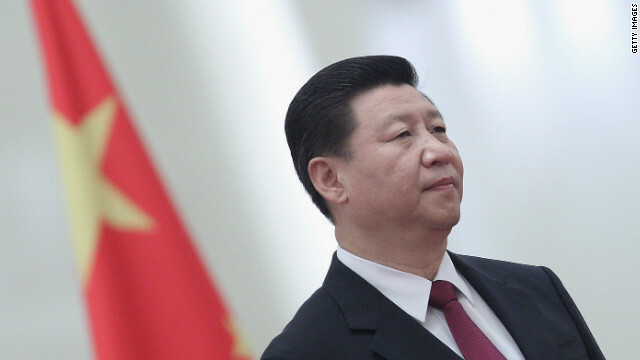 "Ke" is pronounced as "Ker"
"At the moment, Xi's is only interested in strengthening and consolidating his own authority – a necessary strategy to create a sense of legitimacy at the top of the Chinese bureaucracy. Yet it does not convince the people, it does not create a supporting alliance for reform and it does not symbolize any progress for the rule of law in China." Xi has just started so the comments above hardly make sense. Let's be optimistic about a future china and the world. Will the Chinese ever be free to call out Mao as the misguided tyrant he surely was? Have any of you even spent time in China? "We would all therefore love to see Mr Xi as a Chinese Gorbachev" ...of course....Gorbachev government became so weak he himself became victim of a coup attempt...and had to be "saved" by a liberal amiable drunk Yeltsin...someone who during his presidency neglected Russia to near collapse. Things only turned around when hardliner Putin came to rule. If i were Russian i would certainly vote for him. Hey, President Xi has not yet even actually sat in his new office, and since he is a man who hardly speaks in public to promote his image, but already EU is branding him as a hardliner. No wonder all that economic chaos in EU.